For the curious, here's what I suggest. Begin at Carroll and Van Brunt streets. It's a few blocks from the Carroll Street station of the F and G trains. You can also get there via the B63 bus from Brooklyn's Borough Hall. You're near the southern end of the Red Hook Containerport, one of only two such facilities in the city. Containerization, with its bigger ships and need for vast open lots, spelled the end of Manhattan's and Brooklyn's freight shipping industries after World War II. Since freight shipping was what Red Hook was all about, the area declined. Then the city announced it was going to condemn a great deal of land to build a big container port in Red Hook. This ramped up the exodus. 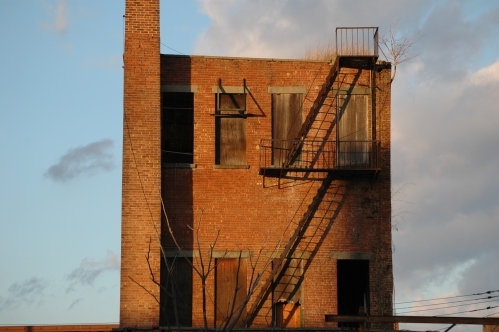 When the city scaled back its plans, much of Red Hook was like a ghost town. It's a fun thumbnail to the neighborhood, if you're not familiar with it and worth a read. It should be the B61, not the B63.